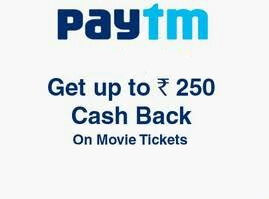 PayTM Movie Ticket Booking Offer January 2018 – Paytm is back with another great offer in which you can get 50 % cashback upto Rs.250 on a minimum of Rs.500 on movie bookings. This offer is valid only for new users i.e, one who never booked a movie on Paytm Before. Hurry this is a limited period offer so use this code as fast as possible. 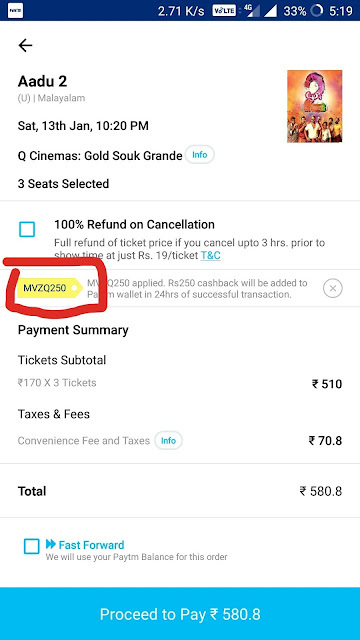 How to get 50% Cashback on Movie Bookings from Paytm ? 1.Download Paytm From here or go to the Web by Clicking here. 2. Now go to the Movie Section on Paytm. 3. Select your City, Time and then select the movie which you want to book. 4. Now select your Seats and Continue. 5. Make sure that the minimum booking amount is at least worth Rs.500. 6. Then in the Have a Promocode Section Enter Code MVZQ250 and Apply. 7. After the Coupon Code is applied continue to Paymentand Book your Tickets. 8. After the booking you will get your Cashback within 24 hours. No details on the code expiry so book fast.